It doesn't mean the «energy efficiency» rating is wrongfully stated, the statement is true, regarding electrical efficiency of the device, yet the cold produced by the device is not delivered to your house as you might think. It is split unevenly between your house and the Earth's atmosphere, where less than 1/2 is delivered to you, all the rest surprisingly enough is dumped into the atmosphere, no matter how many «pluses» they print on the energy efficiency label. Even if we assume 100% efficiency of the device, it simply DISPOSES OF a significant part of its END PRODUCT. Now, let's us estimate how much significant is it. Let's assume you want to cool a room down to comfortable 24 C, in a hot day (37 c, with 68% humidity, which is a typical July day in my home town). Thus the air initially contains 0.03 kg of water per m^3. 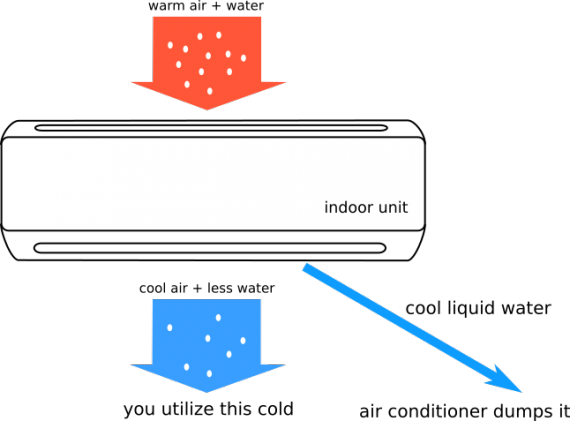 If we now generously assume that the air pump operates at 11 C then we only need to cool 1/2 of the room volume in order to reach 24 C. It means that the heat exchanger produces 100% humid air at 11 C, which contains 0.01 kg of water per m^3. Thus, the heat exchanger dumps 0.02 kg of cool water per m^3 of air. Let's see how big is this number. Finally the ratio is: 16.13 / 38.7 = 0.42 — i.e. 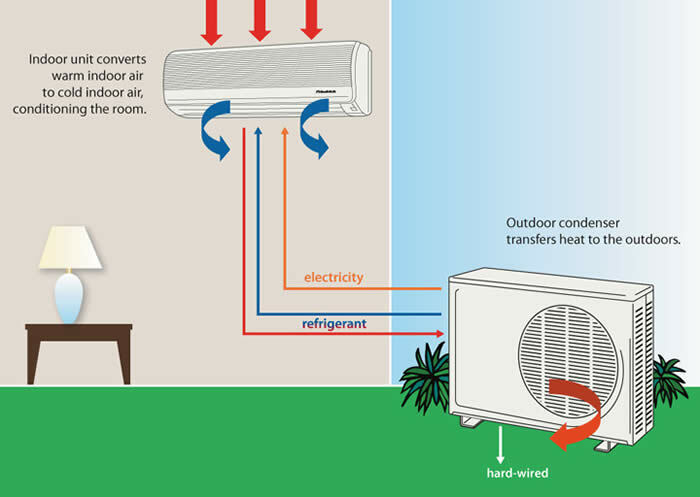 roughly 58% of the cold produced by your air conditioner goes straight outdoors. Of course, it is a very rough estimation, but it gives you the order of magnitude of the phenomenon. Although I tried to give a conservative estimation, feel free to directly measure your air conditioner water output in order to get the precise number — I bet it will be even worse than «60%» stated in the title. This loss does only seem inevitable! The sad part is that this energy is completely recyclable for no cost — all you need to do is to vaporize this water on the heat exchanger of the condenser unit — BUT NOBODY CARES. it was performed in Russian, so I have to translate it for you, however, Dr. Toms is informed of this fact and is welcome to make his corrections if he has any.